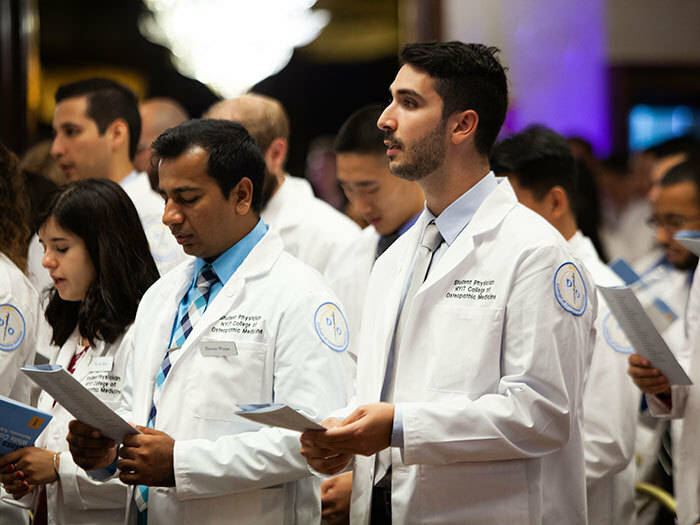 OLD WESTBURY, N.Y. -- In a recent ceremony at the Crest Hollow Country Club, medical students from the NYITCOM Long Island (Old Westbury) campus received their white coats, a rite of passage signifying their official start in medical school. Of the 295 new medical students coated at the August 15 event, six were coated by family members who are NYITCOM graduates, known as legacy coaters, including physician and NYITCOM Assistant Professor Zachary Levokove (D.O. '94), who coated his son Brandon Levokove. Nazifa Tokhi, who was coated by her brother Billal Tokhi (D.O. '15), talked about her admiration for physicians. "Our sister was a cancer survivor, so as kids we spent a lot of time in hospitals, and I looked up to the physicians," she said. "I've always seen physicians as heroes, and now I have the opportunity to be a hero too." The NYITCOM Long Island Class of 2022 will go on to fill the shoes of the Class of 2018, which boasted a 99 percent placement rate. Students from this latest graduating class have gone on to pursue premiere residencies in specialties ranging from ophthalmology, neurological surgery, anesthesiology and pediatrics, at institutions such as Tufts Medical Center, Virginia Tech, Robert Wood Johnson Barnabas Health, and other prestigious institutions. Jerry Balentine, D.O., dean of NYITCOM and NYIT's vice president of Health Sciences and Medical Affairs, welcomed the newest Long Island medical students. "The white coat symbolizes many things. For you, right now, it symbolizes a change. A new path, a profession that you have chosen and in a small way has chosen you," he said. Since its introduction in the medical profession in the late 1800s, the white coat has been a symbol of cleanliness, trust, and healing.